Segatini loses his parents at the age of 7 and he escapes towards the mountains. Sometime after, he was found dying of cold and hunger. As he had no identity papers, he was sent to a reform school, where he met priests that soon notice his ability to draw. After this period, Segatini starts to work shepherding animals in the mountains and, in those moments of solitude, he devotes himself to draw. Both experiences, the catholic reform school and his stays in the mountains are going to determine the motifs of Segatini’s future work, devoted to religious and mountain landscapes motifs. Basing on the Panghiavahli, Luigi Illica, an Italian monk of the 12th century, writes Nirvana. In this text Segatini will find inspiration to paint The punishment of lust. In it, we read “Thus the bad mother in the livid valley, in the eternal cold where no branch turns green and no flower blossoms, turns ceaselessly”. As Segatini believed that the only role of the women is to be a mother, he thought that the ones who lose their child were selfish or evil, so to speak, bad mothers. This way, with The punishment of lust, our artist shows us the punishment of those mothers (symbolically, something that occurred in his own life). 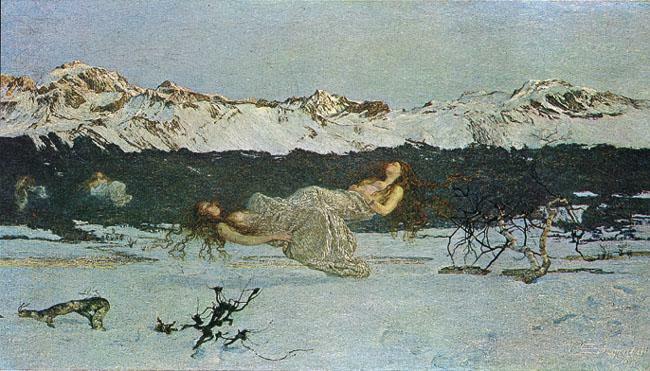 In the painting, we see the Swiss alps in winter. The cold and desolation shows us the face of death. Women, floating in this hell, still, suffer quietly for their sins. Slowly, Segatini will gain international fame and Kandinsky will point at him saying that he is the one of the forerunners of spirituality in art. Moments before he died, Segatini expressed only one wish: “I want to see my mountains”. ~ by Álvaro Mazzino on August 24, 2010. Its last big idea was to build an incredibly beautiful phone, one you’d want to buy and hold and show to your friends. The original One was exactly that, and some of its flaws were easy to overlook in favor of this beautiful object in your hand. That tablet is now available in select markets including France, India, and South Africa. Verizon Wireless recently launched a US model with support for 4G LTE. It sells for $230 with a 2-year contract or $330 without one. This entry was posted on August 24, 2010 at 09:11 and is filed under Symbolism.You can follow any responses to this entry through the RSS 2.0 feed.You can leave a response, or trackback from your own site.